Climate change is not only one of the greatest environmental and development challenges facing the world today, it is one that will have critical impacts on human rights and inequalities, including gender inequality. 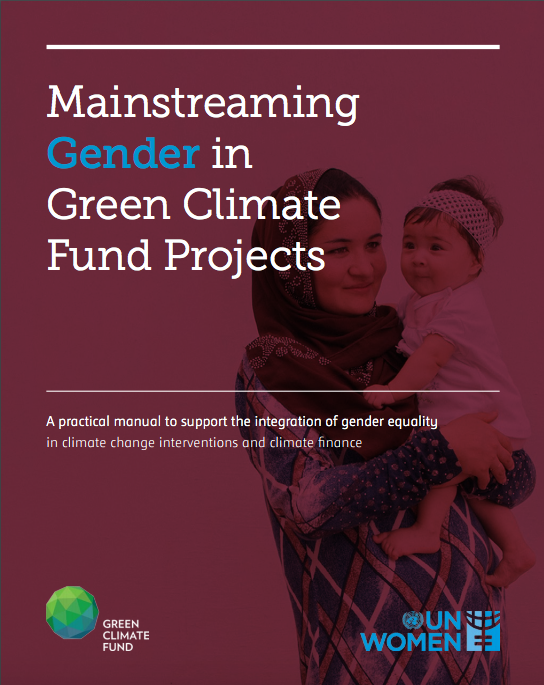 It is therefore deeply appropriate for the Green Climate Fund (GCF) and UN Women to have collaborated in developing Mainstreaming Gender in Green Climate Fund Projects, a practical manual to support the integration of gender equality in climate change interventions and climate finance. This publication comes at a critical time in the global response to climate change. As the portfolio of the GCF grows rapidly, and with it the needs of countries for capacity development, the manual intends to provide national designated authorities, focal points, accredited entities and delivery partners with guidance to effectively – and holistically – mainstream gender in GCF projects and programmes. It is well known that women and girls are disproportionately affected by the impacts of climate change and associated severe weather events. Women’s mortality from climate-related disasters is higher than that of men, and climate-induced floods and droughts exacerbate women’s poverty and unpaid domestic and care work burdens. This is due to factors such as entrenched discriminatory social and cultural norms, a lack of entitlements, and unequal access to land, water and productive assets, compounded by limited mobility and decision-making power in many contexts. At the same time, in many countries women are being recognized as agents of change who make valuable contributions to climate change mitigation and adaptation efforts. Women are building climate resilience and enhancing the livelihoods and well-being of their families by investing in climate-smart agriculture and sustainable energy solutions for home and work. They are preparing for climate induced disasters and finding innovative ways to cope with climate change impacts on communities and environments. This manual is an important first step, one that will support in-country partners to enhance their capacity to address gender concerns in the climate change space – not only to achieve greater and more sustainable climate change results, but also to contribute to gender equality globally.